Place the almonds and the hazelnuts in a food processor and process until you obtain a crumbly flour. Add the rest of the base ingredients and pulse together until well mixed. Press it into the bottom of prepared 8-inch spring form pan and set aside. Rinse the food processor and process the cashew nuts, coconut cream, coconut oil and maple syrup until smooth and creamy. Set aside half of the mixture. To one half of the cashew mixture, add the tea leaves and blend until thoroughly incorporated. Set aside. To the other half of the cashew mixture, add the lemon juice and zest and the blueberries. Blend until a smooth, creamy texture is obtained. Layer the tea mixture evenly onto the base using a spatula, followed by the blueberry and lemon layer. Place the cheesecake in the freezer for at least 5 hours. Remove from the freezer and release the springform pan. 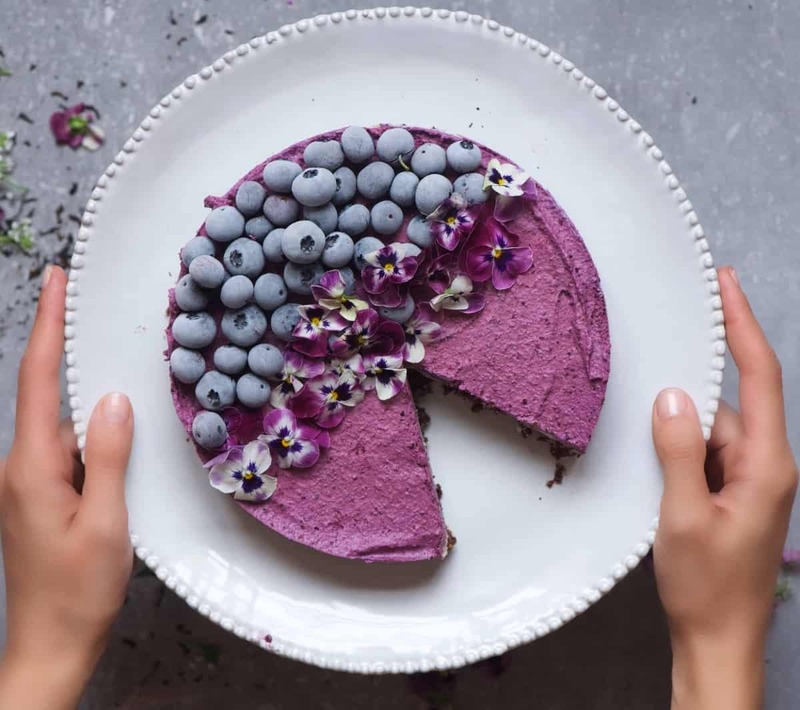 Add any desired decorations to the cheesecake, like frozen fruit and edible flowers, and enjoy. My cashews are soaking as I type! I follow your IG and so glad you have a site with full recipes. This is my first time making any vegan recipes, so I am looking forward to the end result. Hope it tastes as lovely as it looks! This is absolutely beautiful! Do you freeze your blueberries a certain way? Mine never turn out this pretty!